CHICAGO, IL –(ENEWSPF)– Illinois Gov. Rod R. Blagojevich and his Chief of Staff, John Harris, were arrested today by FBI agents on federal corruption charges alleging that they and others are engaging in ongoing criminal activity: conspiring to obtain personal financial benefits for Blagojevich by leveraging his sole authority to appoint a United States Senator; threatening to withhold substantial state assistance to the Tribune Company in connection with the sale of Wrigley Field to induce the firing of Chicago Tribune editorial board members sharply critical of Blagojevich; and to obtain campaign contributions in exchange for official actions – both historically and now in a push before a new state ethics law takes effect January 1, 2009. On November 7, while talking on the phone about the Senate seat with Harris and an advisor, Blagojevich said he needed to consider his family and that he is “financially” hurting, the affidavit states. 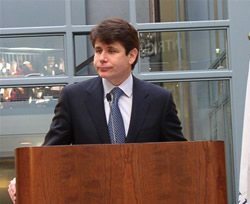 Harris allegedly said that they were considering what would help the “financial security” of the Blagojevich family and what will keep Blagojevich “politically viable.” Blagojevich stated, “I want to make money,” adding later that he is interested in making $250,000 to $300,000 a year, the complaint alleges. Also on November 12, in a conversation with Harris, the complaint affidavit states that Blagojevich said his decision about the open Senate seat will be based on three criteria in the following order of importance: “our legal situation, our personal situation, my political situation. This decision, like every other one, needs to be based upon that. Legal. Personal. Political.” Harris said: “legal is the hardest one to satisfy.” Blagojevich said that his legal problems could be solved by naming himself to the Senate seat. As recently as December 4, in separate conversations with Advisor B and Fundraiser A, Blagojevich said that he was “elevating” Senate Candidate 5 on the list of candidates because, among other reasons, if Blagojevich ran for re-election, Senate Candidate 5 would “raise money” for him. Blagojevich said that he might be able to cut a deal with Senate Candidate 5 that provided Blagojevich with something “tangible up front.” Noting that he was going to meet with Senate Candidate 5 in the next few days, Blagojevich told Fundraiser A to reach out to an intermediary (Individual D), from whom Blagojevich is attempting to obtain campaign contributions and who Blagojevich believes is close to Senate Candidate 5. Blagojevich told Fundraiser A to tell Individual D that Senate Candidate 5 was a very realistic candidate but Blagojevich was getting a lot of pressure not to appoint Senate Candidate 5, according to the affidavit. The public is reminded that a complaint contain only charges and is not evidence of guilt. The defendants are presumed innocent and are entitled to a fair trial at which the government has the burden of proving guilt beyond a reasonable doubt.